read more is not working on my blog. Really cool, good work. I liked the date pins at most. I had modified the theme for you! Hi, have download it to my blog and i love it!thanks a lot for your help..i really appreciate it..
Hey sara please explain clearly . Awesome scheme. Like ct, how do you edit it so that the whole post is showing, rather than “read more”?? So nice.. wanted to know how to make the picture on main page more even squared. Thanks! After downloading , what should I do ? Is there a way to make the thumbnail smaller by percentages instead of absolute pixels? My pictures always gets distorted as thumbnails… I think I must’ve removed the read more function and now I am thinking of putting it back. Thanks! 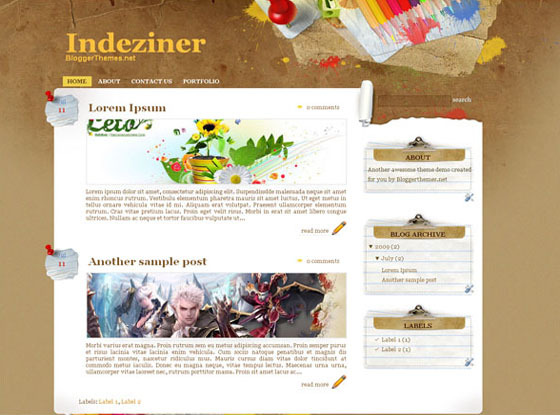 download and install the theme again. it will fix the readmore issue. just tell me the size of pic and I’ll modify the theme just for you. how can i fix it? thanks! Thanks for sharing this design. I downloaded it and everything seems to be working. My question is: Is it possible to edit the buttons at the top that say ‘About’, ‘Contact’ and ‘Portfolio’? Are they pages and can I put in my own stuff? Thanks in advance for any help. Is there any way to get the page to load faster? I have noticed when the page is loading, the white background behind the post doesnt expand to the post content right away while the page is loading. I am having issues with layout. I use Firefox as my browser but if you go into Explorer some of the layout is screwy. My header, the comments butto, written by, etc. How can this be fixed? I think that you are using an old version of IE. Not sure if you are still checking comments, but I just downloaded this template… it is so cute! My only problem so far is that the time for the time stamp appears at the bottom of the post. So it says, “Posted by Kate at” and then at the bottom, left-hand side of the post it will say, “11:23″ or whatever time it is. Is there a way to fix this? Well, excuseme my english is very bad, now 20 years that I don´t speak or write. In my blog is not possible wath date, day and the title is very bad, is all the tiem in my post title. Perdón por mi inglés hace muchos años que no lo utiizo. No puedo ver la fecha en my blog, y el título del blog obstaculiza los títulos de los post. I can not make more little. No puedo minimizarlo desde la cabecera, lo intento pero sigue del mismo tamaño. Por favor se lo agradecería que me lo explicara en español, a ser posible.